Late Preterm Infants and Neurodevelopmental Outcomes: Why Do I Need to Serve and Return? 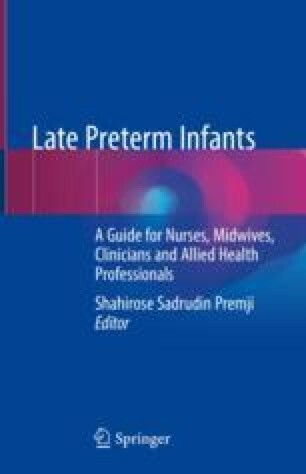 Late preterm infants (LPIs) are the largest group of preterm infants. LPIs have higher rates of morbidity in terms of neurodevelopmental (ND) outcomes than infants born at term. This may be due to changes in brain growth and development because of being born a few weeks early. LPIs are more at risk for developing Kernicterus that can occur in the early postpartum period. Kernicterus may result if jaundice (hyperbilirubinemia) is not treated early. Jaundice could have long-term effects on the brain including cerebral palsy and damage to the ear causing difficulty with hearing. At 24 months of age, LPIs have higher chances of experiencing delays in brain and psychomotor development. In addition, language, speech, and executive functions (mental control and self-regulation) of LPIs are less developed by 36 months. These infants also are at risk for poor educational achievement, including lower scores in Math and English. Early intervention is required at various points during postpartum, infancy, and the early childhood years. Serve and return activities with caregivers are critical to brain development. Follow-up clinics with access to a variety of health care professionals are necessary to provide specific interventions to limit the potential ND impairment (NDI) of LPIs. The Bayley Scales are standardized, individually administered assessment instruments for the evaluation of developmental functioning of infants and young children aged 1–42 months. The Bayley-III Cognitive Composite and Language Composite scores have a mean of 100, standard deviation of 15. The receptive communication and expressive communication subscales yield scores with a mean of 10 and standard deviation of 3. Reliability and validity of these instruments have been established. For example, for the Bayley-III Cognitive Composite: average reliability coefficient, r = 0.91; test-retest stability for ages 19–26 months, corrected r = 0.86; correlation with the MDI, r = 0.60; correlation with the Wechsler Preschool and Primary Scale of Intelligence-III Full Scale IQ, r = 0.79. For the Bayley-III Language Composite: average reliability coefficient, r = 0.93; test-retest stability for ages 33–42 months, corrected r = 0.94; correlation with the Preschool Language Scales (PLS-4), Language Composite, r = 0.66. The WPPSI-IV measure is a standardized, individually administered clinical instrument for measuring intelligence in young children aged 2 years 6 months up to age 7 years 6 months. Full Scale Intelligence Quotients (FSIQ) have a mean of 100 and standard deviation of 15. Strong evidence for the reliability and validity of these measures are presented in detail in the technical manuals (e.g., FSIQ reliability coefficient for ages 3 years and months to 3 years and 5 months, r = 0.95; test-retest stability coefficient for FSIQ, corrected r = 0.93; correlation with the Differential Ability Scales-II General Conceptual Ability score, r = 0.81). The Leiter scale is an individually administered test for assessment of nonverbal cognitive functions in individuals aged 3 years 0 months (Leiter-3) up to adulthood. The cognitive battery yields an IQ score with a mean of 100 and standard deviation of 15. Reliability and validity statistics are reported in the test manuals (e.g., for the Leiter-3 Nonverbal IQ score: reliability for the 3–6 age group is 0.96; test-retest reliabilities for the cognitive subtests range from 0.74 to 0.86; correlation with the Stanford-Binet-5 IQ r = 0.77). The ABAS assessments are rating scales completed by respondents (e.g., parents) to provide comprehensive measures of individuals’ adaptive skills in conceptual, social, practical, and motor domains. The Global Assessment Composite score has a mean of 100 and standard deviation of 15. Reliability and validity measures are provided in the manual (e.g., for the ABAS-3 Parent/Primary Caregiver Form GAC: the reliability coefficient for children aged 3 years 0 months to 3 years 5 months was 0.98; test-retest reliability corrected r = 0.82; correlation with the Vineland-II r = 0.77). The CBCL is a means of obtaining standardized ratings by parents of their young children’s behavioral, emotional, and social functioning. The manual reports that test-retest reliability for the internalizing scale was 0.90, externalizing scale was 0.97, and total problems were 0.90. Criterion-related validity was determined by the ability of the items to discriminate significantly between children referred for mental health or special education services and demographically similar children who were not referred. All except two of the 99 items discriminated significantly (p < 0.01) between the two groups. The PLS-4 and PLS-5 measures are standardized, individually administered clinical instruments for determining language delay or disorder in children aged birth and up to age 7 years 11 months. Total language scores, auditory comprehension scales, and expressive communication scales are norm-referenced with a mean of 100 and standard deviation of 15. The test items assess prelinguistic communication, semantics, morphology, syntax, pragmatics, and integrative language skills. Evidence for the reliability and validity of these measures are presented in detail in the technical manuals (e.g., for the PLS-5: test-retest reliability coefficient for AC for ages 3 years 0 months to 4 years 11 months, adjusted r = 0.90; correlations with the CELFP-2, range from r = 0.70 to 0.82). The REEL is a rating scale completed by parents to provide a measure of their child’s receptive, expressive, and overall language development. Children aged birth to 3 years are compared to norm-referenced samples to provide standard scores, with a mean of 100 and a standard deviation of 15. Reliability and validity statistics are reported in the test manual (e.g., for the receptive language subtest score: test-retest reliability is 0.89; correlation with the early language milestone scale—second edition r = 0.62). The CELFP-2 measure is a standardized, individually administered clinical instrument for determining language delay or disorder in children aged 3 years and 0 months to 6 years and 11 months. Core language scores, receptive language scores, expressive language scores, language content scores, and language structures scores are norm-referenced with a mean of 100 and standard deviation of 15. Reliability and validity measures are provided in the manual (e.g., test-retest reliability coefficient for core language score for ages 3 years and 0 months to 3 years and 11 months, adjusted r = 0.92; correlation with the PLS-4, range from r = 0.73 to 0.76). The CCC-2 is a means of obtaining standardized ratings, by parents, of aspects of their child’s communication that are not easy to evaluate in the traditional clinical assessment. There are ten different scales that take the context of the child’s communication into account and also consider how the children use language in their various environments. For children aged 4 years and 0 months to under 16 years, scaled scores with a mean of 10 and standard deviation of 3 and percentile rank scores are calculated for each of the ten scales. A general communication competence score is calculated by comparison to a normative sample and reported in a percentile ranking. The test manual provides cutoff scores that represent the bottom 10%, 5%, and 3% of children for each 2-month age interval and reports that inter-rater reliability for ratings given by parents versus teachers/slps ranges from r = 0.157 for more context/environmental-driven scales to r = 0.529 for the more structural speech pronunciation scale. Internal consistency for each scale and predictive validity of the GCC are described in the manual. The Parent Report of Children’s Abilities-Revised is a questionnaire-based test for assessing cognitive and language development in moderate and late preterm infants. This test has very good concurrent validity and sensitivity (90%) and specificity (76%) for detection of moderate to severe cognitive developmental delay in the moderate and late preterm infants. This test may be used as a clinical screening tool. The PAT-3 enables professionals to assess articulation errors. The test consists of 72 photographs that test consonants and vowels. The same photographs may be used in speech-language remediation. The PAT-3 was standardized in a 23-state sample of more than 800 public and private school students in prekindergarten through grade 4. Percentiles, standard scores, and age equivalents are provided. Internal consistency, test-retest, and interscorer reliability coefficients approximate 0.80 at most ages and are in the 0.90s.